This newsletter is all about tips. 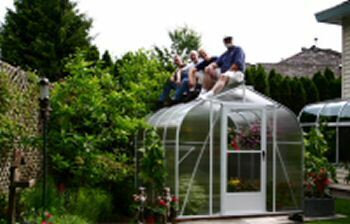 If you are thinking of purchasing a greenhouse, read the tips to know BEFORE you purchase. If you already have a greenhouse, we've provided tips for greenhouse gardening during the month of April. The first thing you will need to address is the design of the greenhouse. Often customers like to choose a custom design to match their residence. Do you want a free standing greenhouse, or one that is home-attached? 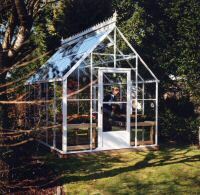 The advantage with a free standing greenhouse is that you can position it anywhere, maximizing sunlight exposure. Home-attached lean-to style greenhouses offer convenience, added insulation and can make good use of smaller spaces. Consider roof slope options, straight or curved eaves and optional ornamentation. Which greenhouse structure best suits your climate? If you live in an area prone to high winds, heavy snowloads or the occasional hurricane, you'll need to consider the weather tightness of the greenhouse with respect to drafts, water penetration and strength. Know if there are any specifications that you must have in your area regarding wind and snow loads. You'll definitely need to consider the best location for your greenhouse. Think about the angles of the sun from season to season. It is best if you can locate the greenhouse so that it receives at least 6 hours of sunlight per day during the winter months. The best position for the greenhouse - align the longest side of your greenhouse to face south. This way, the roof will attract the most sunlight possible. If you are operating the greenhouse in warmer months, you can always use a shade cloth to bring down the temperatures and prevent plant burn. There are several options for greenhouse foundations, and you'll need to decide which option is best for you. Many people use wood frames or concrete pads for hobby greenhouses. Wood frames are easy and inexpensive to prepare. They also allow for long term flexibility in case the greenhouse ever has to be moved or extended. Concrete should be chosen for a more permanent site as it will last for generations to come. All foundations must be level and square before installation of the greenhouse structure. Always check your local building codes regarding site requirements, and if a permit is required. The glazing material can impact what you are growing. Fivewall polycarbonate is the best at heat efficiency, followed by double glass, then twinwall polycarbonate followed by single glass. There are pros and cons to each material. 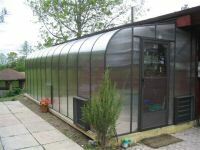 Polycarbonate is best used in either really warm climates or cold climates as it keeps the greenhouse warmer in the winter and cooler in the summer. However, it is a product that generally has a lifespan of about 15 years and will eventually need to be replaced. On the other hand, glass is a product that usually lasts a lifetime. Some customers prefer the pleasing affect of seeing through the glass greenhouse, while others are more passionate about the functionality of the greenhouse. Will you need to heat your greenhouse? If you are going to use your greenhouse during winter months, you will need to provide heat to the greenhouse. Again, the plants that you are growing will dictate what temperature they need to thrive at. Most plants are fine above 45 degrees F, but there are exceptions. This is considered a cool greenhouse and is good for growing cooler crops like lettuce and spinach. A warm greenhouse requires a night temperature of 55 degrees F and a hothouse requires a night temperature of at least 65 degrees F. This is primarily used for orchid growers and tropical plants. Heat can be provided by any source, electrical, propane or gas, to name the most common. Always remember that any time there is a prolonged power outage, it could be disastrous for your plants. Consider accessories needed in the greenhouse. How will you arrange benches or shelving. What about hanging baskets? If you are using the greenhouse in warmer months, you will need an exhaust fan system. Handy thermometers make it easy to check your air temperature in the greenhouse and outside. April is an exciting time for gardeners. For many of us, it's the first time we begin to see emerging flowers from bulbs. After a long winter, who doesn't enjoy the beauty of colorful flower bulbs sprouting from the earth. Days are getting warmer, and you will need to pay attention to the ventilation in your greenhouse to ensure that it is adequate. If you disabled your solar roof vents, now is the time to ensure they are working automatically again. 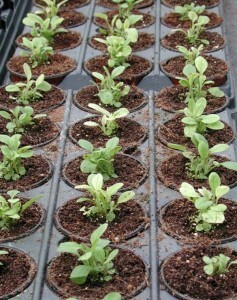 For those of you growing seeds and cuttings, they should be potted before they become too large. This is also a good time to establish tomatoes and cucumbers, which will now need regular attention. Annual flowers should be prepared for their move outdoors near the end of May or in early June, depending on your climate. You may find that you need shading as the daytime temperatures become warmer. Shade cloth is available and can easily be installed on the side of the roof which receives the most amount of southern sunlight. You may have to water plants more frequently and you should check your plants regularly. Watch plants for disease and pests. Greenfly, whitefly, weevils or red spider mites will now be active. Watch for slugs as well, which have been known to destroy seedlings. Use double sided sticky tape to trap the flies. The good news with warmer temperatures is less heat is required at night. Be sure you do not expose your plants to temperatures that are too low, and always watch for frost warnings. You can also hand pollinate your plants, particularly if you have fruit. Use a soft brush or a ball of cotton to lightly touch the plants and move from plant to plant. This is best done at mid-day, and should be repeated for several days. Sun Garden Greenhouse Sale - Only a Few Left! Now's your chance to get the Sun Garden greenhouses painted green or brown for half of the regular price. The Sun Garden greenhouse is regularly priced at $3,723.00 and is currently on sale for $2,195.00 for greenhouse models painted white. Now you can upgrade to have the Sun Garden greenhouse painted dark brown or forest green for only $150.00 more. (The regular price is $300.00 more). The Sun Garden greenhouses are constructed of twinwall polycarbonate and measure approximately 8' wide x 8' long. Hurry, this offer is available only while supplies last, and there are only a couple left. We'd like to hear from you. Whether it's a story about your greenhouse or your garden, send in your story or photos to shelley@ecolad.com and we'll feature them in our upcoming newsletters. Happy Gardening and we'll see you in May!